And now here are the books that grabbed me. Supergirl meets the New Super-Man! To help get her amplified powers under control, Supergirl will need to travel to China and train under I-Ching and Kong Kenan for help. 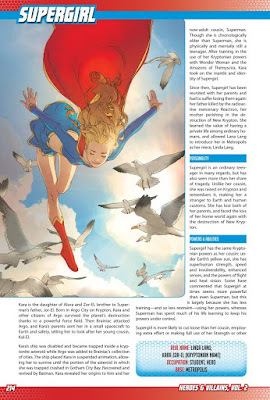 But when an international threat hits the city before her training is complete, is Supergirl ready to save the world? 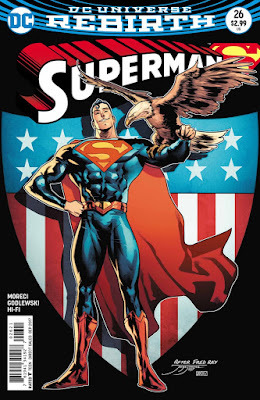 First off, I love the cover, an homage to Superman #205. 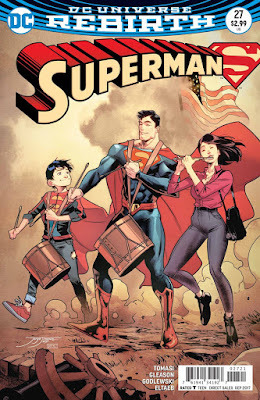 And I really like the idea of the Superman family acting like a family, co-starring in each other's books. A Supergirl with amped up powers? Interesting. Too bad we don't have Robson Rocha on art. I thought Robson was going to be the regular artist.On to the rest of the book! A new series inspired by the DC Collectibles statue line! It’s been decades since Governor Lex Luthor turned Gotham City into a modern utopia, saving his people from the devastation that made the rest of the continent a wasteland. But his city isn’t paradise for everyone. If the Lexes network misfires, and a citizen wakes up and steps out of line, the Bat and his minions are brutal in restoring the status quo. 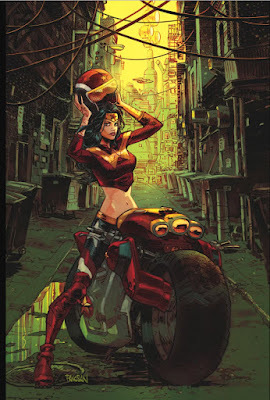 So when young Kara Gordon, whose ridealong tech has never functioned optimally, rushes headlong into the Freescape, she’s shocked to find Gotham City Garage—where new friends might become family, if she lives long enough. 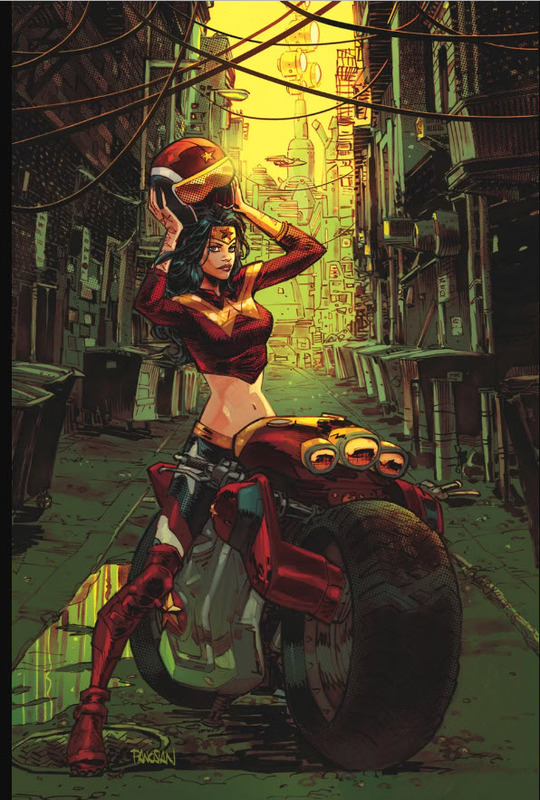 Gotham City Garage strategist Barda Free is determined not to let the new kid slow them down. But when her team rolls into trouble in Clayface Valley, will Kara be the only thing standing between them and sudden death? With Bombshells being dropped, maybe I should give another book based on a statue line a shot. This sounds like Akira or Mad Max meets DC Superhero Girls. I am grabbed by the concept of Kara Gordon, Supergirl as Batgirl's sister. That alone makes me intrigued. I have said I'm not a fan of the waist tattoo. But I didn't like the Bombshell Supergirl outfit either. It's all about the story. We finally learn who Mr. Oz is. 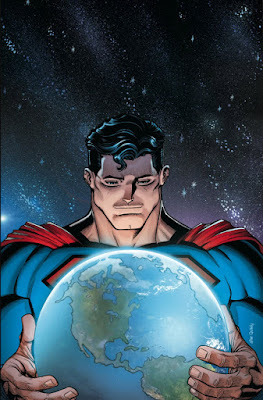 I love this cover, an homage to All Star Superman #10. But getting to the end of this story makes me very happy. Who will it be?? “IMPERIUS LEX” part three! Steppenwolf, field general of Apokolips, enlists Superman’s son Jon into his Canine Cavalry to stop Superman from helping Luthor reclaim the throne once held by Darkseid. Looks like we’ll be picking up the God-Killer storyline from earlier in this title. Lex leading Apokolips is a fascinating turn, even then. And anytime I see Fourth World characters, I’m happy. 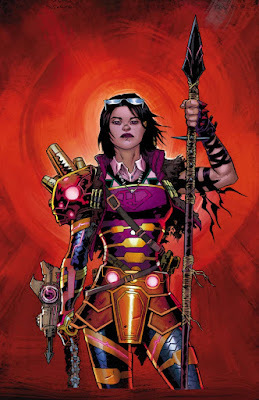 And Lois as a Fury … well, I’ll have to wait and see. “Planet of the Capes” part four! Superboy and Robin were training to become the next Superman and Batman—but they never signed up to be the saviors of the multiverse! Ready or not, the boys have their work cut out for them as the endless alien armies of Yggardis descend upon our young heroes! Loving this book. The boys being thrust into a Crisis-sized threat is funny. They are so inexperienced. They haven’t gelled as a team. How will they win?? “SUPERMAX” part two! 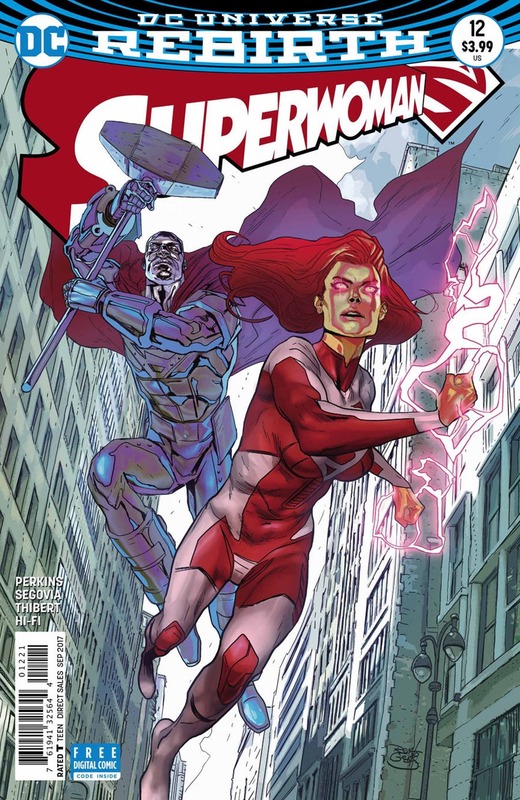 It’s a clash of incredible power as Superwoman and Supergirl struggle to contain the might of Maxima! 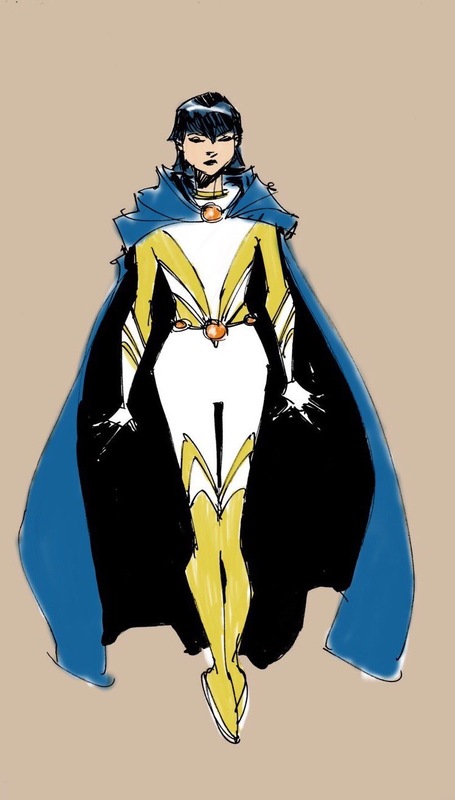 But with Maxima’s origin revealed, and a startling new villain looming on the horizon, do our heroes actually need to save Maxima...or be saved by her? Perhaps the solicit I am most interested in. I loved K.Perkins update of Maxima when she was on Supergirl. This looks like a more classic Maxima than the young princess Kara befriended. 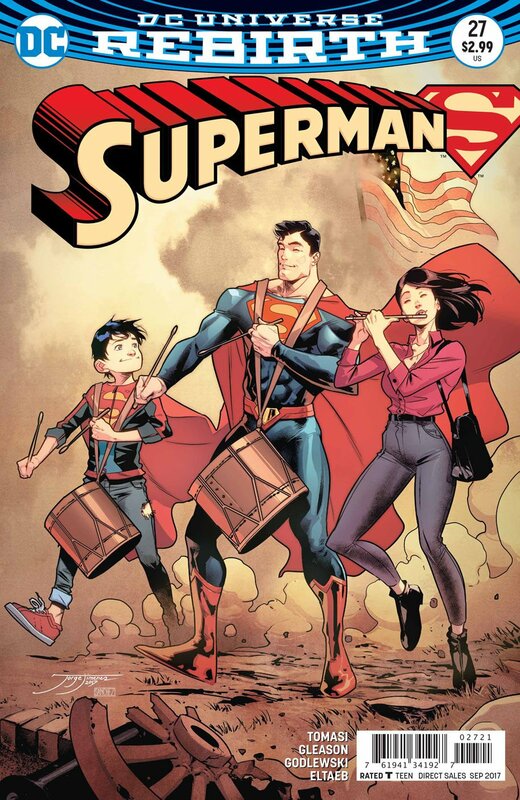 And, as I said, I love the Superman family starring in each other’s books. “Equilibrium” part two! Kenan’s battle with the Suicide Squad ended in disaster, and when the New Super-Man of China comes to, he wakes up in...Gotham City? All-Yang’s plan to corrupt our hero and show him the true nature of China’s destiny stands revealed! The idea that the evil I Ching might be called ‘All-Yang’ is just about perfect. I am hoping this book sticks around! Inspired by the art of Ant Lucia, the new DC Designer Series Bombshells Action Figure line continues with Bumblebee and Supergirl, as seen in the hit comic-book series! 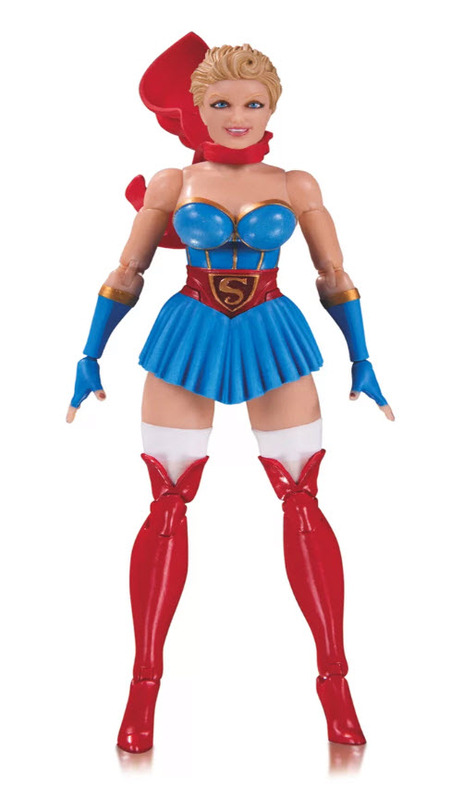 These action figures capture the spirit of the Bombshells line and come with their own character-specific accessories! Definitely not for me. I’m not a fan of this costume enough to grab this for the collection. But if you like this outfit, it looks like a great figure. So a pretty good month! Action Comics #984 came out this week and was another incredible issue, wrapping up the Revenge storyline in a very entertaining and satisfying way. I really feel like this was a big blockbuster movie of an arc. There was tremendous action. There were incredible character moments. There was a reclamation of a supervillain who I was tired of seeing. 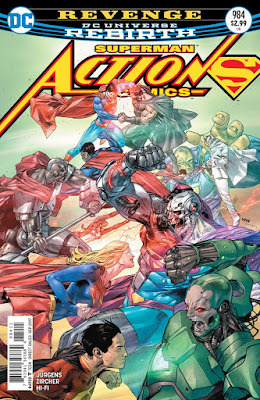 And best of all, there was the return of some Superman mythos, something that will be fascinating to follow. 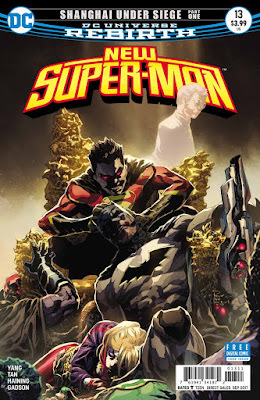 Writer Dan Jurgens really weaved a wonderful story as the motivation of the villains completely flipped halfway through the story, keeping me very engaged and on the edge of my seat. I said it last issue and I'll say it again. This is the best General Zod story I have read in about 20 years. I have been bored with Zod prior to this arc where he suddenly became a deadly, strategic, and somewhat sympathetic character. After seeing Jack Herbert and Viktor Bogdanovic play with all the Superman family, we get Patrick Zircher's take. The art here is stunning. As always, Zircher gives the proceedings a cinematic feel, delivering a well-paced and gorgeous book. 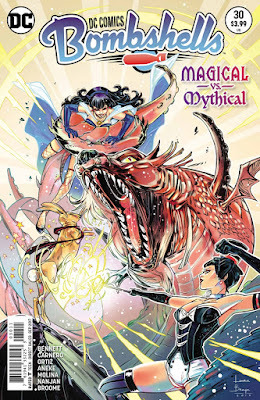 DC Comics Bombshells #31 is the penultimate issue of this title and the penultimate issue of me collecting this title. I have been talking about dropping this title for a while. The series is coming to an end next month. There is a new title coming out shortly thereafter but I think I am out. The stories have become too meandering and too confusing. And the whole thing seems to be weighed down with the messages that Marguerite Bennett is trying to impart and proselytize to the audience. I have said it before and I'll say it here. Tell me a good story that has a message and I'll be engaged. Have a message you want to say and then construct the story around it and everything just feels forced and I feel preached at. And it is a shame that I am leaving because the first year of this book was brilliant. The story came first there. And it is also a shame because Supergirl has taken center stage in this last arc. 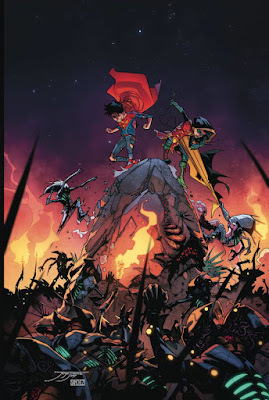 Super Sons #6 came out last week and was just an absolute delight of a book. 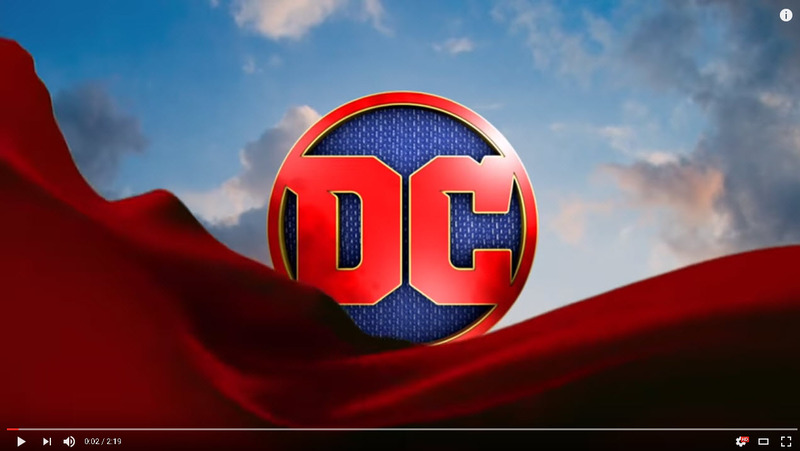 I have been loving this fast-paced, fun-loving look at the DCU through the eyes of these young heroes since its inception. And I have also loved how the differences between the sons, the down-to-Earth Jon Kent and the cynical assassin Damian Wayne, has been a nice catalyst for the stories. I think we definitely have seen the two boys rub off on each other in a nice way. And, of course, the frenemy aspect of their relationship has been tussle-filled blast. 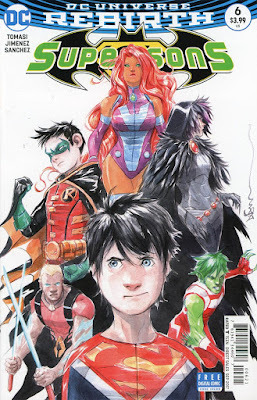 Writer Peter Tomasi does his typical great job of showcasing the personalities of the two boys, with those differences seeping in at the edges. Throughout this book, Damian has come on as something of a bully, telling Jon he is doing things wrong. And we have seen Jon, at times, try to adopt some of Damian's ways. Here, we see some of that subtle bullying again. At times, I wonder why Jon would hang with Damian, unless he thinks Robin is 'cool and edgy' or is just desperate to share the super-powering side of his life with a peer. My hope, based on the cliffhanger, is that Jon will rub off a bit on Damian for once. Jorge Jimenez's art has sizzled since issue #1 and that doesn't change here. He so effortlessly shows emotion, warping anatomy slightly to sell the feeling. When Jon is happy, you just see him exploding off the screen with an impossibly huge smile. But it his take on the Titans that grabbed me here. Great stuff. 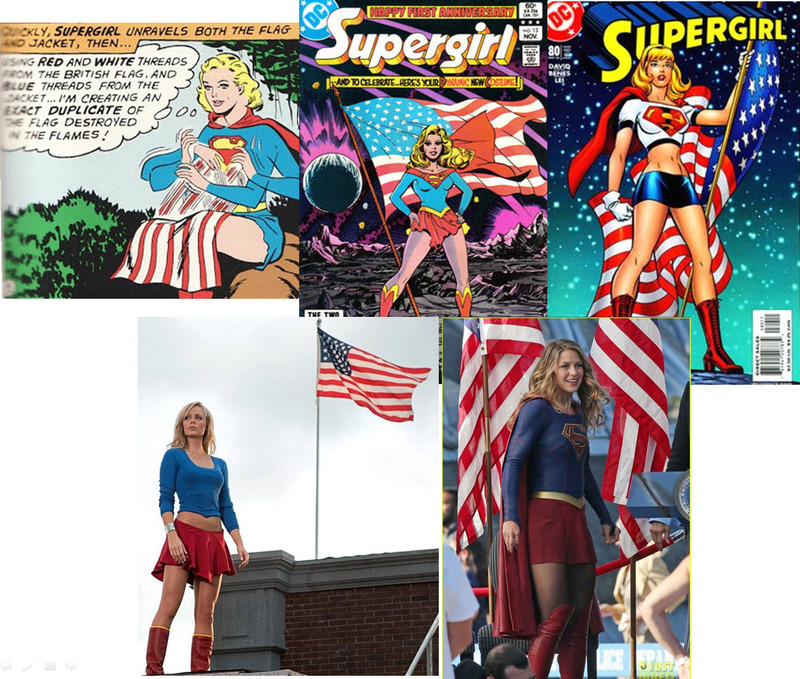 Last weekend was the San Diego Comic Con and most of the Supergirl news revolved around the upcoming third season of the show. Search YouTube or Twitter and you'll get snippets of the many interviews and panels the cast did. The decision I made, he couldn’t have made that sacrifice. But me, I couldn’t have lived with myself if I hadn’t. I will always make the decision I made. I am not a human. I tried to be but I’m not. Kara Danvers was a mistake. It is clear that Kara is grieving over losing Mon-El, a decision she made. And her defense is to suppress her emotions, to deny her humanity, and become perhaps a colder, more calculating 'alien'. And the scenes we see in the preview do a nice job of echoing that. Perhaps with too many screencaps I break down the trailer. Last week I gushed about Action Comics #983, claiming it transported me back to a younger age. 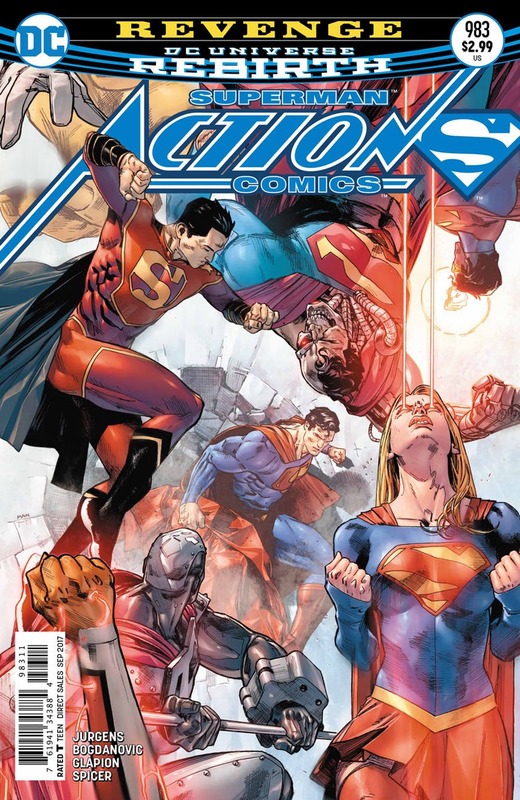 The brutal fight, the twists and turns, the Superman Family feel of that comic grabbed me. Suddenly I was young Anj again. This week I got transported back in time again. Reading Superman #27, I felt like that young Anj again. This time it wasn't the epic action or crazy super-heroics that did it. Instead it was the lesson in civics within the issue. I grew up in a time when comics were a place to learn lessons about good and evil. It was a place where the heroes were immaculate role models. I learned right and wrong from my parents, growing up in a stable, loving home with 'by the book' parents. But comics reinforced those lessons. Do good by people. Follow the law. You have rights but we live in a society; your rights shouldn't supercede anyone else's. This was also a time where the heroes starred in one page public service announcements talking about not running away, keeping the streets clean, and the danger of hitchhiking. This issue shows Superman and Lois taking a vacation, reminding Jon what a great country America is at its core, and teaching him a few lessons along the way. Plotters Patrick Gleason and Peter Tomasi give us a nice throwback sort of a story. And the art by Scott Godlewski is loose enough to keep the book from feeling weighed down by the material. In their continued effort to make me poor, DC and other companies continue to put out Supergirl merchandise. And in an odd cosmic convergence, a bunch of new statues have all been solicited or revealed within the last few days, many at San Diego Comic Con (and thanks to blog friend Firebird for passing on the photos). I probably won't get all of these. My poor wallet! Every so often, a complete surprise is dropped into your lap. Blog friend Mart Gray tweeted me that I should head to https://www.comixology.com/ because there would be a Supergirl surprise waiting for me. 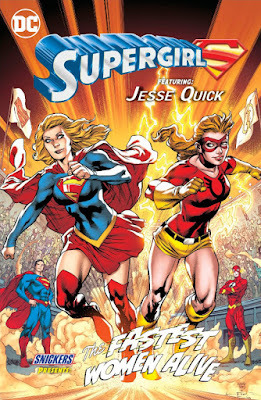 Supergirl and Jessie Quick team up in the Snickers free comic The Fastest Women Alive. The story is a nice little tale by writer Stuart Moore and artist Paco Diaz that not only promotes Snickers (they really satisfy you) but also includes nice character moments between Kara and Jessie, and even homages DC history nicely. 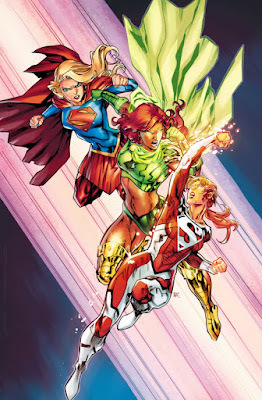 As a fan of Jessie Quick, someone missing since Rebirth ... as a fan of these two being teammates in James Robinson's run on Justice League of America ... I was thrilled. And the art is nicely rendered. I think the two main characters look great! On to this free comic ... seriously go download it! 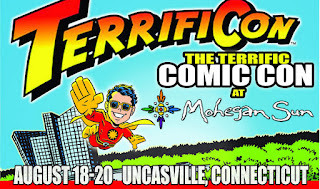 We are rapidly approaching my convention season and while Boston Comic Con has always been my main show, this year the incredible guest list for the nearby Terrificon lured me across state borders. I am very excited for this show and have really had a hard time preparing for it. There are some great creators going to this show. As I have said in prior convention posts, I try to limit the books I take to get signed by a creator to a maximum of 10. 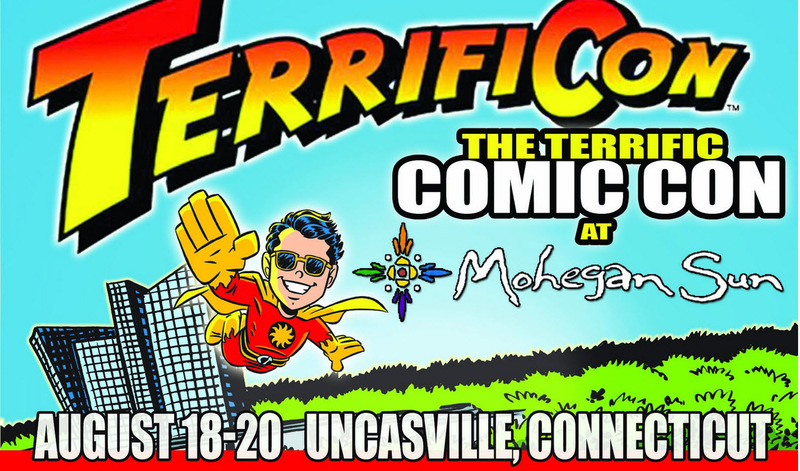 But some of my favorite creators, who I have followed for decades, are coming to this show. And so limiting my sig list to the aformentioned 10 books has become something of a conundrum! And, as usual, there are some artists at the show that I am hoping to grab commissions from. As usual, it is all about the timing. I haven't been able to line anything up beforehand so far so I also think I will need a little luck. So who am I going to see? 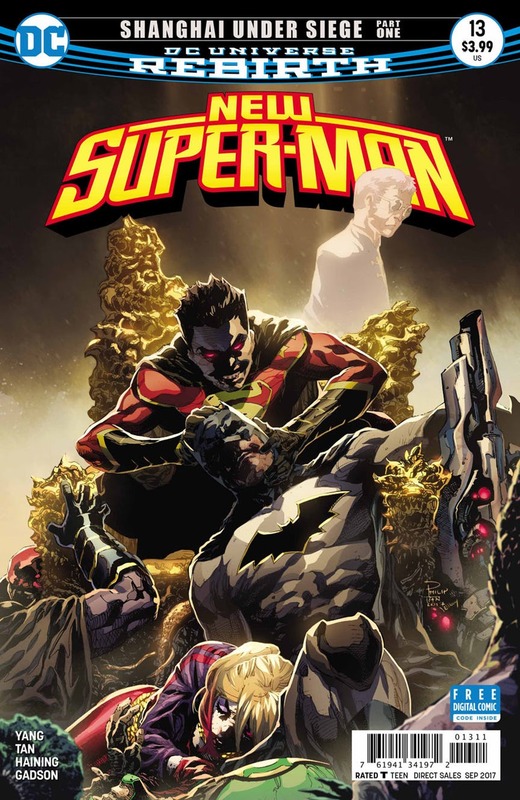 New Super-Man #13 came out last week and really began the job of tightening all the plot threads that have been moving through the book into one story. And it feels like we are getting close to a major conclusion. I finished this issue and was already ready for more. This issue really felt like that, a turn of the crank, adding tension. As much as this book is a New Super-Man book with Kenan Kong as the axle that the stories revolve around, it could just as easily be called Justice League China. That is one of the things that has most impressed me with writer Gene Luen Yang's work on the book. We are dealing with a lot of Asian analogs to classic DC characters, but they have remained fresh and distinct from their namesakes. Between the role call of antagonists and protagonists, at times this has felt like the Legion of Chinese Super-Heroes. Yang keeps it all cohesive and moving forward and that is impressive. And Billy Tan's smooth art on the book has been wonderful since he took over art chores. There is a smooth feeling to the proceedings, whether it is action or emotion. I hope he stays on the book for a while. But what actually happened? On to the book! It seems hard to believe but we are 4 issues in to K. Perkins run on Superwoman and things are finally starting to gel a bit. Perkins was dealt something of a mess of a character and has been trying to shore up the continuity gaffes of a character who has only been around for a year. Superwoman #12 moves a number of the plots forward nicely. The villain is defeated. The mystery of Lana's powers is starting to be solved. Lana has to try to stabilize her home life and her work life. And all of this happening with the mystery of Steel's nephew Zeke simmering in the background. But the main thing about this issue is the ending. Lana is finally a little confident in her abilities and her life's direction. After issues of anxiety and indecision, we see Lana smiling and that makes me smile. I know she is in for a lifetime of struggling with these feelings but at least she is coping and maybe even winning. The art from Stephen Segovia and Art Thibert crackles nicely in the fight scenes. 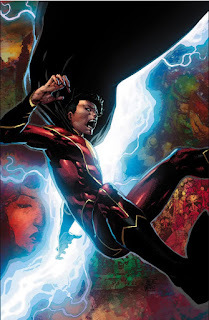 There is sort of Leinil Yu feel to some of the scenes and that is high praise. Overall, I enjoyed this issue. But really what I want is to read the Lana of next issue. 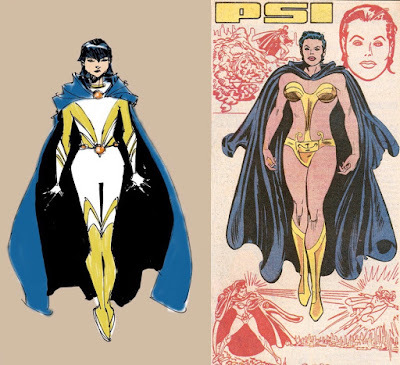 Over in Twitter, as I had in my review, I noted that the new Psi costume was reminiscent of the original version. 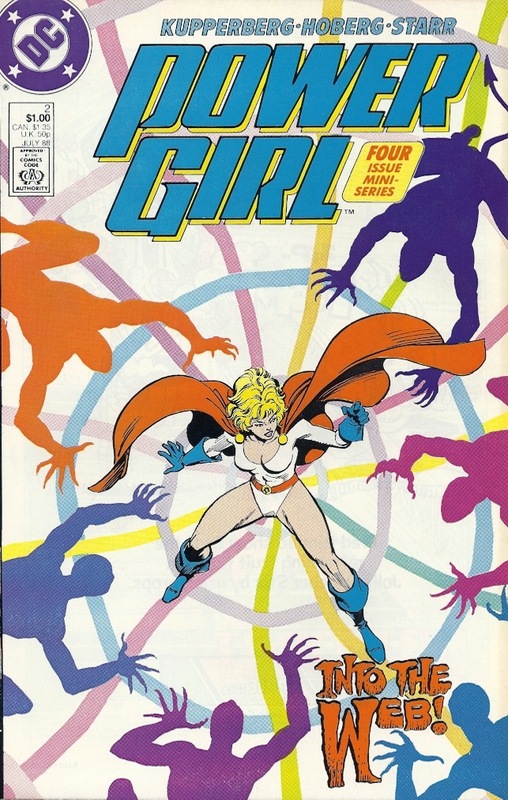 That the expanse of white, sort of a negative space, was evocative of the vast amount of skin that the original Psi showed in the Daring New Adventures of Supergirl. 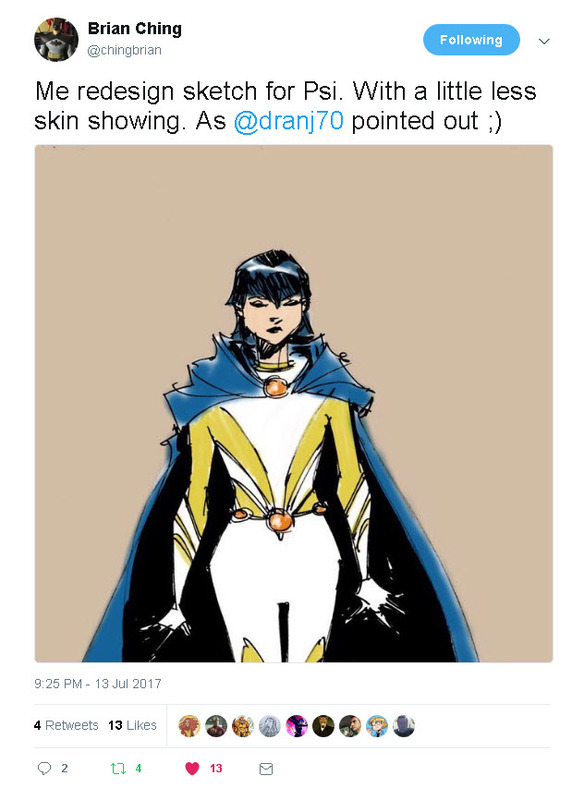 Brian Ching saw the tweet and then shared his design sketch for the new Psi and thought I should share it here for those who missed it. You really can see how much of a feel for the original when you put them side by side. Unclear if Ching was trying to ape the Who's Who page, but it works for the comparison. I've always been a fan of Psi, in all her incarnations, so glad to see her back. Here is the actual tweet! 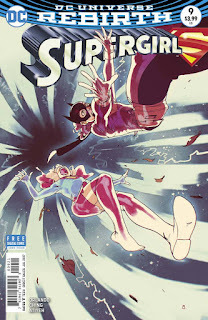 Supergirl #11 came out this week, the end of the Batgirl crossover which brought the Maid of Might into the Phantom Zone. This arc was somewhat rapid fire, ending a bit quicker and running a bit shorter than I anticipated. Blink and it's over. Maybe I have become so used to the 'stretch for the trade' story-telling these days? Looking back, writer Steve Orlando has mixed in long arcs, done in ones, and this shorter plot in the first year of this book. I like it! And there is plenty to like about this story as it plants the seeds of the new Rebirth continuity. It is clear that after this arc, Batgirl and Supergirl are going to be friends and allies. Perhaps, if we are lucky, we'll get a World's Finest arc every year! 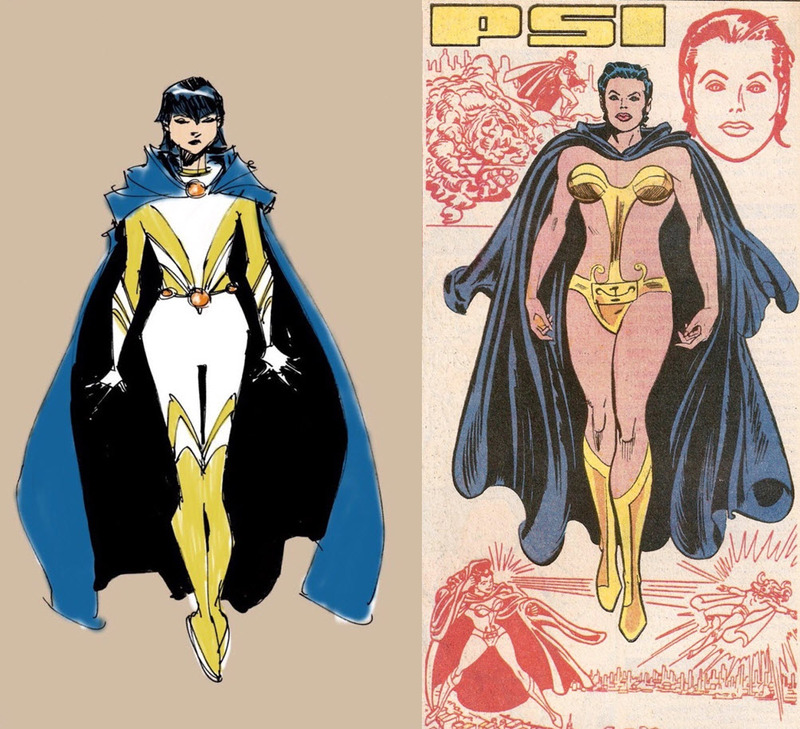 There is also the addition of Psi to the catalog of Supergirl characters in the DCU. She ends up more of a friend than an enemy but we all know that can change. 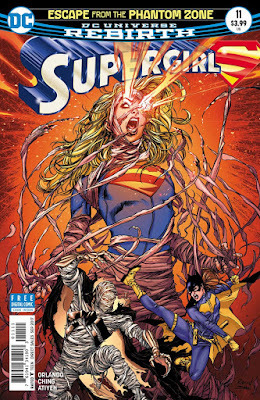 And lastly, there is another Supergirl show addition to the comic, one I welcome. The art is done by Brian Ching and he does a good job of mixing in the the action sequences with the heart-to-heart emotional moments that are mixed in the issue. Ching is leaving the book and Robson Rocha begins on art next issue. Robson really has a dynamic style as seen on the cover. I am sad to hear that Bengal is leaving the variant covers. 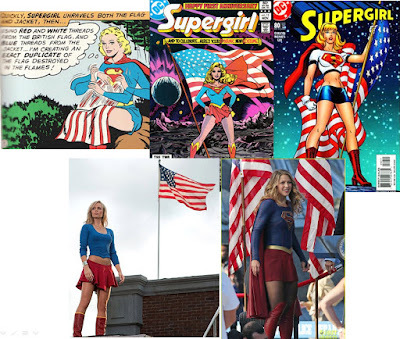 Since the inception of the Supergirl title post-Rebirth, writer Steve Orlando has been doing yeoman's work trying to merge the continuity of the DC Universe Kara with some of the broader ideas of the Supergirl television show. So show specific ideas like CatCo, the DEO, and Jeremiah & Eliza Danvers. 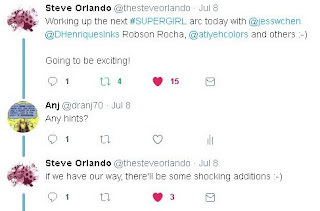 When I asked for a hint, Orlando said there could be some "shocking additions". Given that proclivity to merge the show's sensibilities with the comics, I figure the shocking hint means we'll be seeing Livewire soon! And that makes me happy. 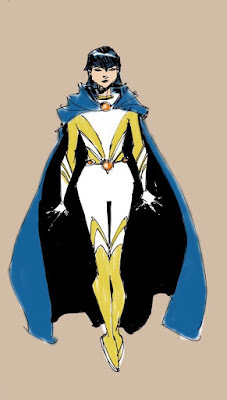 Because I think the time is right to convert Livewire to an official member of the Supergirl Rogue's Gallery ... in the same way that the Silver Banshee seems to have gone that way. And there is the history between the two! My thanks to blog friend Siskoid and the folks at the Fire and Water Podcast Network show Hero Points Podcast for pointing out the existence of this DC Adventures role playing game. As a fan of role playing games in general and specifically the Mayfair DC Heroes RPG, I was thrilled to hear about this. In particular, the idea of there being a heroes and villains book of stats and histories made me think I need to hunt these down. This is the closest I have seen to a Who's Who book in some time. And it has measurable stats! Once again we can see who is stronger, faster, smarter. This site being what it is, I thought I would share the Supergirl pages. Thanks again to Siskoid for sharing them. 32 years ago this month Crisis on Infinite Earths #7 was on the stands. Supergirl was killed saving Superman and ultimately the multiverse. It is a powerful moment, one worthy of her. Unfortunately, the continuity backlash erased her from existence and memory. Suddenly no one remembered Supergirl. 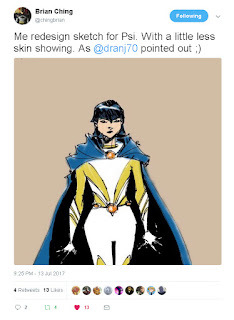 Perhaps even stranger, it seems that even DC creators couldn't name her. You might remember the not too cryptic S*p*rg*rl comment in Secret Origins. I was once again reminded of this time period when I read the 1988 Power Girl mini-series, written by Paul Kupperberg. 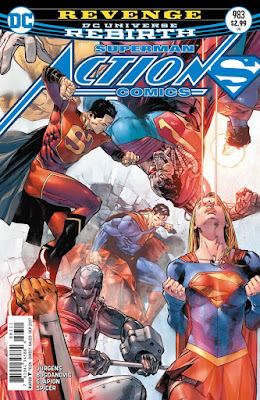 Superman #26 was a 'one and done' rest issue, focusing on the relationship between father and son, Clark and Jon. Written by Michael Moreci with art by Scott Godlewski (both new to me), the story was a welcome pause after the breakneck velocity of the Manchester Black Black Dawn. It also includes one of my absolute favorite things about the Superman mythos, Pa Kent homespun wisdom. I am a complete sucker for flashbacks where we see how Clark became the man he is, bolstered by the knowledge of the Jonathan Kent. Usually Pa's words are perfect, the ultimate 'be a good person' pep talks. But this issue is different and that made me like it even more. The characterization between Jon and Clark is a bit more bristly than usual. There is more friction here. I am assuming that part of it is Damian rubbing off on Superboy. But it felt just a smidgen off from what we have seen in the first two years. But it is that grit that makes the Pa Kent stuff work so I can roll with it. The art by Godlewski is sold stuff. He has to flip from the idyllic Kent farm to the robot-filled streets of Hamilton. It all flows nicely. Overall this was a very nice issue from two up and comers. I really enjoyed it. As a father myself, it resonated a bit with real life. DC Bombshells #30 came out in print this week and was the next chapter in the final arc for this title. And, incredibly, I think it is the final arc for me with these characters. This title has been on shaky ground for the last several months and this issue cinched it. I think this title has sort of lost its way. The first year of this book was such a delight, introducing us to these characters, riffing on the film styles of the day, and bringing in the politics of the day. 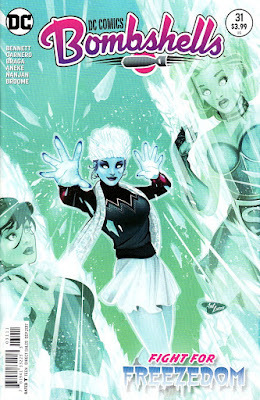 The zenith was in DC Bombshells #12, in a battle over London, where Stargirl sacrifices herself. I applauded this book then. Since then, the stories have been a bit all over the map. Writer Marguerite Bennett began to use the book as a vehicle for an agenda. And as I have said, if you have a character driven book with an agenda, I am on board. When you have an agenda book with characters, it often falls apart. I also think that Bennett has started to be a bit too cute and a bit too glib in a way that seems wrong for the book. The art, done by the excellent talents of Carmen Carnero, Richard Ortiz, and Aneke, continues to shine. This was a war book. And even though war is there, it isn't that any more. This book hasn't crackled for me like it did early on. 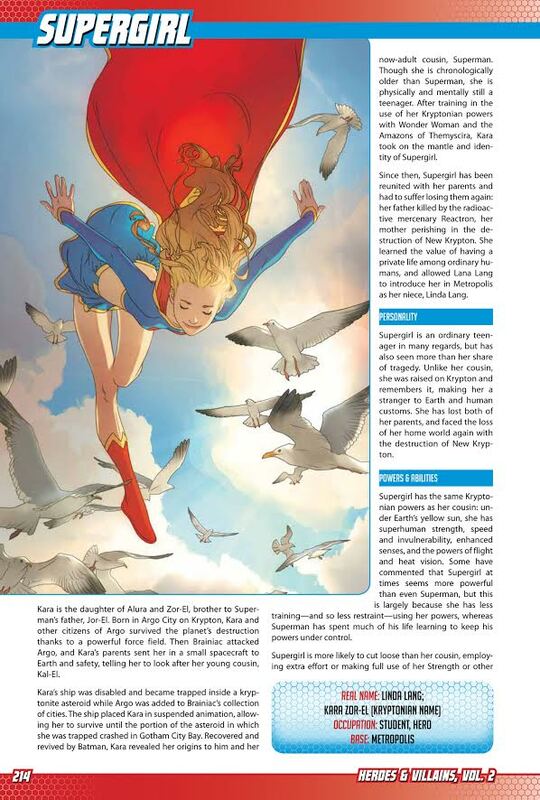 And it is something of a shame because the Supergirl story is actually the high point for the current story. But when this volume ends, I think I am out. 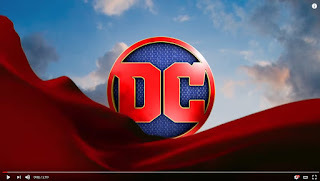 The plot synopsis for the third season (or at least the early episodes of season 3) of Supergirl has been released by WBTV in preparation for the upcoming San Diego Comic Con. There isn't much to this synopsis that we didn't know. But it is great to keep the momentum of the show rolling along. And here is the synopsis itself. 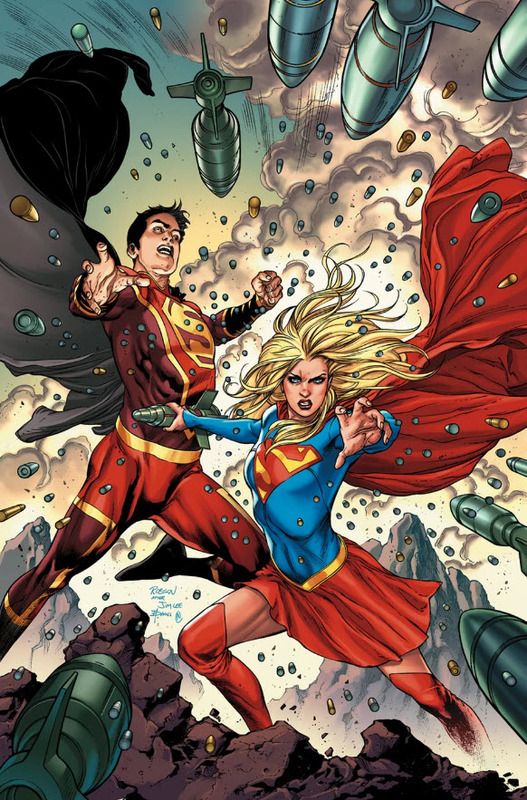 Ridding National City of Queen Rhea and her Daxamite army was a major win for Supergirl, but one that came at a significant cost, as Kara was forced to sacrifice her budding relationship with Mon-El. When season three returns with all-new supercharged adventures this fall on The CW, Kara and team will come up against a new threat in the form of DC Worldkiller, Reign. 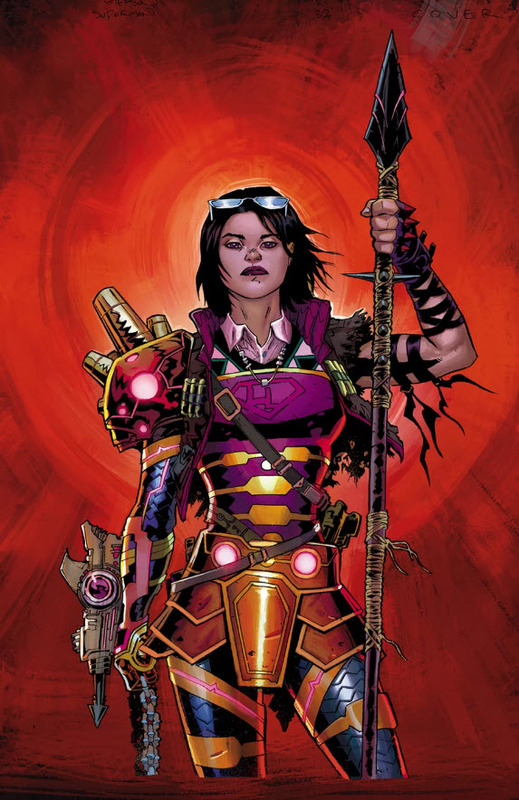 Want to know more about Reign and what she has in store for the Girl of Steel? Join the series’ cast and creative team for a special video presentation, followed by a Q and A where they’ll discuss this hot topic and more! 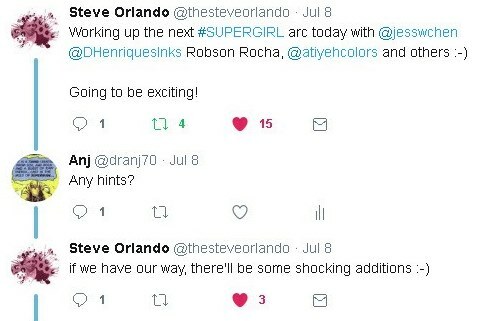 We had known that Reign was going to be the big bad so no news there. 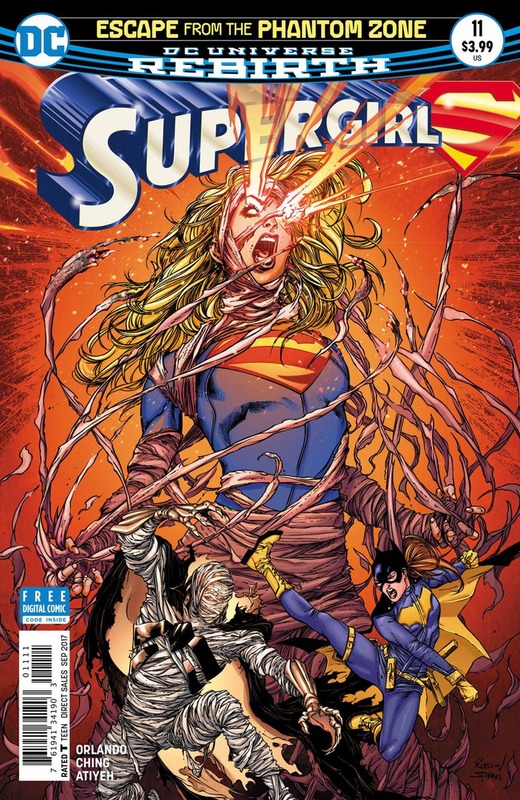 But I do like that they dropped the Worldkiller title, a key part to her story in the New 52 Supergirl title. We already know that Zor-El was involved in the creation of the Medusa virus on the show. Will he have a part to play with the creation of Reign as well? Even if it is unknowingly? I also am surprised that Mon-El is mentioned so prominently. Will his character be a presence (even in absence) during the whole season? Or only as a major element in the earliest episode. We'll get a panel with some video snippets at SDCC. Hopefully we'll get some more answers. Or at least some hint! The Supergirl panel is on Saturday July 22 from 3:30-4:10pm in Ballroom 20. Any pals that are going to be in attendance, please feel free to let me know what you saw! The sales numbers for May came out earlier this month and I keep waiting for some sort of slow down of sales attrition for the super-titles and it just isn't happening. I hope DC isn't looking at Rebirth as some sort of failure. I doubt it as the company seems to be doing better overall since this re-imagining. But it is my nature to worry. On to the individual books! Supergirl #9 was the first part of a Batgirl crossover with the new World's Finest heading into the Phantom Zone. I thought for sure the combination of Babs and the Phantom Zone would maybe shore things up. I will say that it is so hard to equate sales and orders. Maybe this book flew off the shelves and store owners wished they ordered more. And, of course, digital sales are unknown. We can only go by the numbers. I thought this was a fun if fast moving issue with a lot of deep cuts. So how did it sell? Off to the barbecues and fireworks! Happy Fourth of July to all who celebrate!!! 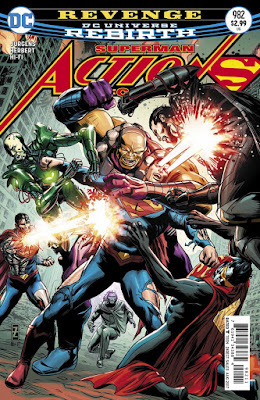 Action Comics #982, the next chapter in Revenge, came out last week and was a perfect middle chapter, moving the pieces on the board, building momentum to the finale, and adding a few new mysteries. This book ends with a truly phenomenal splash page, a great cliffhanger, and a moment I feel I have been waiting for since the New 52 happened. If this comic was only that page, I would probably give it a high grade. Trust me ... we'll get there. Writer Dan Jurgens certainly keeps the plot moving along. He has a lot of moving parts to deal with in this story. The Revenge Squad is 6 members deep. He has Lois, Jon, and Superman to write. And we get the other guests that come on board. That sounds like a Legion of Super-Heroes comic. But Jurgens takes the time to make sure we know each character's motivations and to make them unique. The art is done by Jack Herbert and Jose Luis and both bring great emotion and action to the proceedings. There are a number of panels here which struck me. One has become my Twitter header. And that ending page! It all works well. This issue ended and I immediately wanted to read the next part. That is the sign of a great middle chapter.